UPDATE: Monster Miles Davis Trumpet headphones now available in the UK | What Hi-Fi? One of the more intriguing products we saw at CES 2011 back in January were these Miles Davis Trumpet headphones (see original story below). Well now they've finally arrived in the UK, priced at around £300. They're being offered as a specially packaged set along with the seminal Miles Davis album Sketches of Spain, which has been remixed and remastered in Monster High Definition Stereo (HDS) and high definition surround sound. The headphones also come with a special magnifier so users can see the miniature laser-etched Miles Davis signature and Monster logo on the trumpet housing. The days when Monster Cable just made – well, cable – are long gone. For while the company announced at its CES 2011 press conference that it's lowering the entry-level for its range with a $29.99 HDMI interconnect, the big news is the further expansion of its line-up into more special edition headphones and accessories, and even a complete in-car range. The most striking new arrival, at least in hi-fi terms, is the company's Miles Davis Trumpet headphones. 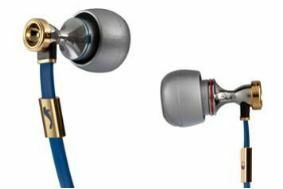 Not only are these $349 in-ears said to have the smallest driver in any headphone, they also follow the styling cues of the pricier Miles Davis Tribute 'phones, with trumpet-mouthpiece-shaped earpieces finished in gold and brass. A miniature Miles Davis signature and Monster logo are etched on the housings – they're so small, Monster provides a special magnifier so you can admire them! – and a customised version of the company's ControlTalk headphone cable is supplied for those wishing to use the earphones with iPhones and iPods. This special version, which allows playback control on the devices as well as having a microphone and answer button for the iPhone, has keys shaped like trumpet valves. At the opposite end of the spectrum is a new range of products tied in with the release of TRON: Legacy. There are the In-Ear T3 headphones, a TRON:Legacy Audio Dock for iPhones and iPods, and the TRON PS3 Slim Power Station for the Sony games console. But the flagship model is the TRON:Legacy Daft Punk Special Edition Headphones, which come complete with noise-cancelling, Monster's LED Light Drive System to create animated lighting effects, and a removable boom microphone for gaming or use with phones. The $350 headphones will come packaged with a remix of the Daft Punk soundtrack for the movie, which has been created using Monster's High Definition Headphone Surround processing, able to create a surround experience from two channels. Finally the in-car range includes a ruggedised iCable USB to Dock Connector Cable for iPods, iPads and iPhones, two iCarPlay Dorect connect devices to interface Apple players with car systems with mini-jack inputs, and two PowerPlug USB chargers. There's also a Bluetooth Handsfree Car Kit for phones, and a novel iMotion CarPlay Direct Connect charger/control unit, which allows drivers to control Apple Portable devices with simple hand gestures, thus making driving safer.